Was the Washington D.C. Navy Yard Shooter, Aaron Alexis, a Target of Mind-Control? It’s been a long time since I’ve blogged about anything (a whole month in fact), as I’ve been busy working on a book project for a friend of mine. However, a hell of a lot has happened in just that short amount of time, and one thing in particular is literally screaming at me to write about it. Needless to say, were I to not blog about it, I would be remiss in my duties as a journalist covering para-political subject matters. I’m speaking of course of the Aaron Alexis shooting at a Washington D.C. Naval Yard, where Alexis shot and killed 13 people before finally being shot himself. To say that this case smacks of a mind-controlled MK-ULTRA-like shooter would be something of an understatement. But, I’m sure most people will believe whatever ABC, NBC, CBS, and CNN tells them to think about this 2nd largest shooting on a US military base after Ft. Hood. However, as I’ll show, even the mainstream media is having a hard time ignoring the “truth” about this particular case, even if they have usually marginalized (if not ignored) the most important facet to understanding the story. First, we should ask ourselves- “Who was Aaron Alexis? 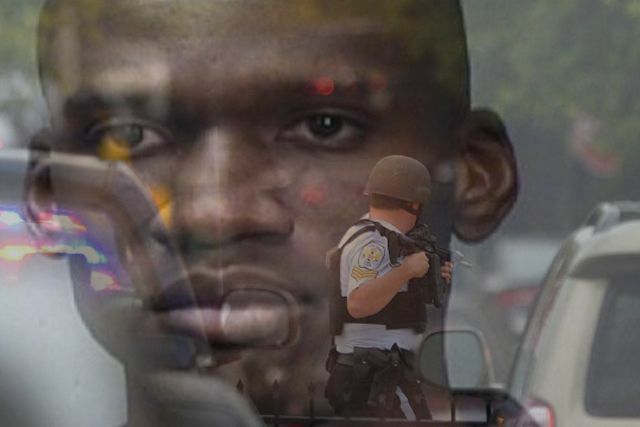 And, more importantly, why did he go on a murderous rampage with a 12-guage Remington shotgun against fellow civilian contractors?” By most accounts, Aaron Alexis was described by those that knew him as something of a loner and a somewhat angry man, who lived in Ft. Worth prior to taking his fatal trip to Washington D.C. Although he was given an honorable discharge from the Navy in 2007 for various low-level and seemingly innocuous infractions, on the surface (at least) it didn’t appear that he was the walking time bomb that he would eventually become. After all, he was a practicing Buddhist, which is the only religion that’s never started a war. So, what could cause a 34-year-old black man, who adhered to the peaceful tenets of Buddhism to suddenly snap? As Secretary of Defense, Chuck Hagel, is now admitting…there were plenty of warning signs that weren’t acted on. And, later when Alexis was no longer a naval reservist but instead working for a computer systems contractor called “The Experts”, he still had a “Secret” level security clearance and a valid I.D. card for entering the base. According to Alexis, he got into a verbal altercation with a strange man at the airport, and he later told the Newport, Rhode Island police that he was subsequently being attacked with an electronic beam weapon of sorts, hearing voices, feeling vibrations, etc. The people that are attacked and electronically harassed by various frequency-generating devices have come to be known in the murky world of para-politics as “Targeted Individuals” and (despite media obfuscation and denial) some form of electronic mind control has been in existence, since at least the late 1930s when Dr. Jose Delgado was experimenting with remote controlling a bull implanted with an implantable brain chip. He would go on to write the rare, early classic book on the field called Physical Control of the Mind: Toward a Psychocivilized Society, which Zbigniew Brzezinski adopted for his Machiavellian political philosophy in Between Two Ages: America’s Role in the Technetronic Era. The mind-control experiments, gleaned from the work of men like Jose Delgado and Nazis such as Joseph Mengele the infamous “Angel of Death” who ended up escaping justice to live in Paraguay, went towards training guys like Dan Mitrione and Larry Layton (both of whom were known agents for the the CIA) in brainwashing and controlling future stooges working in close connection with the CIA such as the cult leader Jim Jones. Aaron Alexis also visited the ER of a VA hospital in Newport, Rhode Island on August 26th three weeks before the shooting at the D.C. Naval Yard ostensibly for insomnia. According to the LA Times, the Newport Police Department even warned the Navy in Newport on August 7th that Alexis was a security risk, since he was claiming to be “hearing voices” and “hallucinating”, due to unseen people following him that were using a “microwave weapon” on him. He was known to be put on psychiatric medication at the time. If you remember correctly, one of the Columbine School shooters, Eric Harris, was also on an anti-depressant drug, Zoloft, (later prescribed Luvox that was in his system at the time of his death), and it is an open secret that known side-effects from many of these anti-depressant drugs include “aggression”, “depersonalization”, “hallucination”, “mania”, and “psychosis”. So, what role did psycho-pharmaceutical drugs, Alexis was taking, play in this shooting? We might not ever know, but it certainly does add yet another twist to the story. The use of pharmaceutical drugs in brainwashing and creating unwitting accomplices in violent acts is not as far fetched as it might initially appear, given the history of psychiatry and their role in just these kinds of programs in the past such as Ewen Cameron’s mind-control brainwashing experiments on patients in a Canadian hospital under the auspices of the CIA’s MK-ULTRA program. We might also ask- “Why was the Capital Police Containment and Emergency Response Team (CERT) that are a well-trained and heavily armed security force protecting the US Congress told they couldn’t enter the Naval Yard, when they were less than a minute away from the gate?” One would assume that during an emergency such as this, particularly one so close to the sensitive nexus of governmental power as Washington D.C., that any bureaucratic red tape of law enforcement jurisdiction wouldn’t have stood in the way of CERT being allowed to take out Alexis and potentially save numerous lives in the process. However, they were told to stand down by the Capital Police Chief. Why? Also, it was reported by the media that the communications between the various law enforcement agencies weren’t working during the time that Alexis was killing people with a shotgun. Again, we are asked to believe that this was also just a mere technical failure. However, the “smoking gun” to me was the fact that Alexis was reported to have scrawled the words “Better off this Way!” and “My ELF” on the stock of his shotgun. And, as I’ve already alluded to in this post, ELF clearly stands for “Extremely Low Frequency”. The Obama Administration has been voraciously attacking the 2nd Amendment and pushing for more “gun control” legislation, and this gives them that much more ammunition to restrict gun ownership…if you’ll pardon the pun. So far, we’ve had a series of “shooter incidents” including the Aurora Joker shooter (a patsy for an assault by other unknown masked characters), the Sikh Temple shooting, and the Sandy Hook school shooting (that based on my investigation might not have even taken place…and certainly not in the way that we’re being told). Also, keep in mind that this was all going on in Washington D.C. during the political backdrop of heated debate over the chemical weapons attack on civilians in the town of Ghouta near the Damascus region of Syria that Obama was quick to blame on Syrian president, Bashar al-Assad. So, what better way to divert congressional opposition (so to speak) into an attack of a sovereign nation than to stage a psy-op attack in the nation’s capital in order to garner sympathy for this idiotic unilateral attack? Looking deeper into this, however, it becomes clear that it wasn’t Assad’s government at all that attacked the civilians but rather the Al-Qaeda rebels themselves that used the sarin gas on the town, and themselves in an accident, that killed about a dozen of the jihadists. These chemical weapons were given to them by Saudi Intelligence and specifically by Prince Bandar, who acts a liaison for the the Saudi Royals and the US State Department. Fortunately, Syria has some powerful allies…foremost of among whom is Vladamir Putin of Russia, who wrote a New York Times editorial about why the US should exercise diplomacy in regards to Syria. Sometimes, it might very well take a tough bully like Putin to put another bully like Obama and the US world police army in check. And, if there’s one thing I’ve learned over the years, it’s that you should never play chess with a Russian, especially when the geo-political stakes are this high and your reason for attacking is based on a lie.